When Marina Mercer comes to claim her yearly spell, Amelia’s protests fall on deaf years. 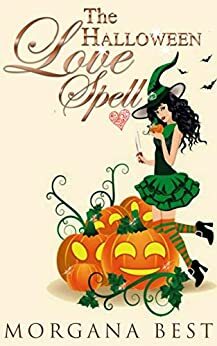 The last Halloween spell nearly got Amelia killed; the house is distracted, and Amelia accidentally cooks up something she shouldn't. Who is responsible for the murder of Amelia’s obnoxious bank loan manager? As there are so many variables, the police lose interest and are keen to withdraw from the case. And will Amelia’s investigations be of no account, or will they be given credit? 5.0 out of 5 starsAussie author wins again! New surprises in every book, but never a disappointment or shortage of laughs! I don't want to get into spoilers here, but Amelia is truly spell challenged and the specifics will keep you laughing even after you've finished the book. Grab a copy and make your day fantastic! Halloween has come again, and with it, Amelia's obligation to cast a spell for the descendant of the witch responsible for reuniting Amelia's grandparents in the afterlife. This time, it's as love spell with a twist - find out who is responsible for the descendant's boyfriend losing his job. Amelia goes to work, only to mistakenly bring back the witch responsible for splitting up Amelia's grandparents in death. Oh, and the person responsible for the boyfriend losing his job has been murdered. Amelia must also solve his murder when she becomes a suspect. Good storyline, interesting characters, and a logical plot twist bringing a neat conclusion. 5.0 out of 5 starsPerfect Halloween read! I just love this series! Another funny paranormal mystery from Morgana Best, perfect to read at this time of year. If you're looking for a fun Halloween read, pick up this book! This is one of my absolute favourite series. I love the unique setting of a small town in country Australia, I love the humour, and Amelia's truly terrible cooking skills make me feel better about my own. Oh, and Alder? Yep, I'm a little in love with him. If you're looking for a witchy mystery that will make you laugh out loud, this is the book for you. I've enjoyed this series from its inception. It's been a treat watching the characters grow. There is a clever mystery, intriguing characters, a lot of suspects and humor. A perfect cozy mystery to pass the time or keep me up reading to the end. The only negative I might give it were some typos. I've gotten accustomed to the Australian grammar and spelling. Looking forward to the next book. Love how the relationship between Alder and Amelia has developed. More please. Any day Marina Mercer will show up in Myles Woods and Amelia will have to perform a spell for her. This contract was made between Amelia's grandmother Thelma and Marina's grandmother Nama. The spell must be done or Thelma and her husband Wolff can no longer be together in the after life. So when Marina asked Amelia for a love spell the laughter begins. thank goodness at times no one was around when I was reading I couldn't help but laugh out loud. Amelia just happens to get herself into another murder. The police always looking at her as a person of interest. Amelia with her cohorts slowly try to get to the bottom of the crime with a few bumps along the way. Plus the house with an attitude. On to the next story enjoy.